These surface mount thermistor sensors have an adhesive surface on the bottom of the sensor. Just remove the peel strip and apply to any dry, solid surface. 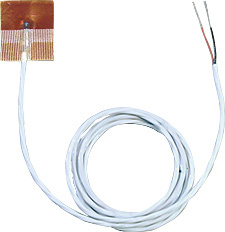 These sensors are great for temporary installations, or for areas where installation options are limited. Nota: Notes: For additional cable length, add required length to end of the model number and $2.60/m ($0.80/ft) to the price. For a phone plug, add “–PP” to the model number and $7 to the price. For tighter interchangeability, substitute the thermistor part number from the table below and add the price adder to the sensor price. Optional over braiding is available, add “-SB” to the end of the model number and $6 per meter ($2/ft) to the price.